Dr. Amundson received his degree at Southern Illinois University in 1995. 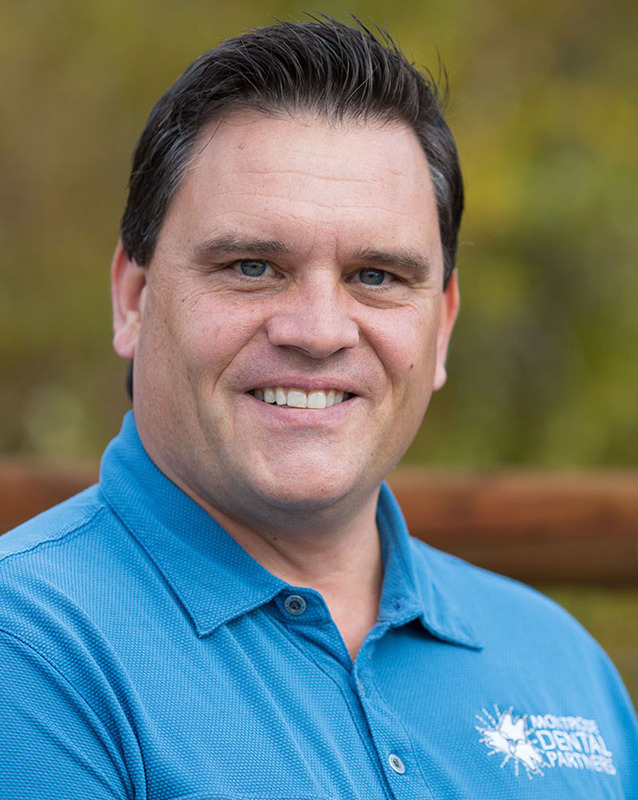 He practiced dentistry in his hometown of Rockford, IL for 2 years before the lure of the mountains and outdoors brought him to Colorado in 1996. Dr. Amundson had a private practice for 15 years in Littleton, Colorado prior to moving to the Western Slope of Colorado in May of 2011. He is a member of the CEREC Doctors Mentors Club and the Frank Spear Faculty Club. He also has completed many courses for Advanced Dental Studies & the World Laser Institute for Dental Laser Certification. His hobbies and interests outside of dentistry are cooking, biking, skiing, playing golf, fishing, playing guitar, hiking and camping. Dr. Amundson, his wife & two daughters look forward to discovering all of this and more in Montrose and the beautiful surrounding mountains. Dr. Horkan received her degree from Creighton University School of Dentistry in Nebraska before re-located to the western slope of Colorado. Having previously undergone an Advanced Education in General Dentistry residency, she joined Montrose Dental Partners in 2015. Dr. Horkan shares the belief of “Dentristy with integrity” and practices comprehensive patient centered care for the whole family based on each individual’s need. As a part of an ever-evolving profession, she takes over 100 hours of continuing education a year and has undergone advanced training at the world renown Kois Center in Seattle Washington to provide patients with the highest quality of care. When not working, Dr. Horkan and her husband love a good adventure. Exploring all that the western slope has to offer, they are avid lovers of the wild outdoors. Dr. Tea is a Montrose native and grew up coming to this very office! 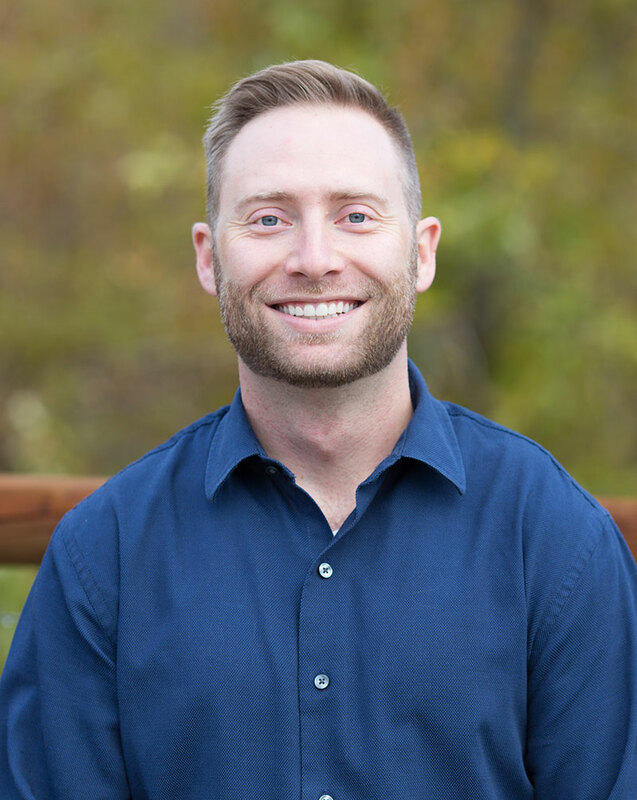 He received his degree from the University of Colorado School of Dental Medicine in 2015 and went on to complete a 1-year advanced training in general dentistry where he became proficient in dental sedation, advanced endodontics (root canals) and surgery. Dr. Tea is passionate about providing the best dental care to you and your family. He takes pride in making your visit a painless and comfortable experience. For patients who experience fear and anxiety, Dr. Tea is able to offer conscious sedation to put you at ease during your visit. Dr. Tea and his wife Rachel are happy to be back home and can be sited outside the office on mountain bike trails, hiking the Colorado 14ers, or fly fishing and camping with dog, Mogley. Lyn recently moved back to Montrose after living in Southern California for 15 years. Her family has been in Montrose and the surrounding areas for over 100 years and her parents grew up here. Lyn has been in the dental field for over 30 years and has a passion for helping people. She has worked in a clinical capacity as well as administrative and corporate settings. Please welcome her back to our practice. Lyn enjoys taking advantage of this beautiful country by hiking, camping and fishing with her faithful dog “Tater”. She loves to travel and visit new places. Additionally, she is very involved with her church and teaches Bible study to pre-schoolers through the AWANA program. She has 2 sons, Dylan, age 22, and Patrik, age 21, that are busy with their own journeys, both boys live in Southern California. Lyn looks forward to spending many years here in Montrose, living and working in this wonderful community. ​Karla has lived in Montrose since 1994 and has worked in the dental field since 2010. She helps make the patients feel comfortable from the time they walk through the front door to leaving our office. She can help you understand your insurance benefits and financial responsibilities. Karla is married and has a son and 2 dogs. In her free time, she enjoys traveling, camping and spending time with family. 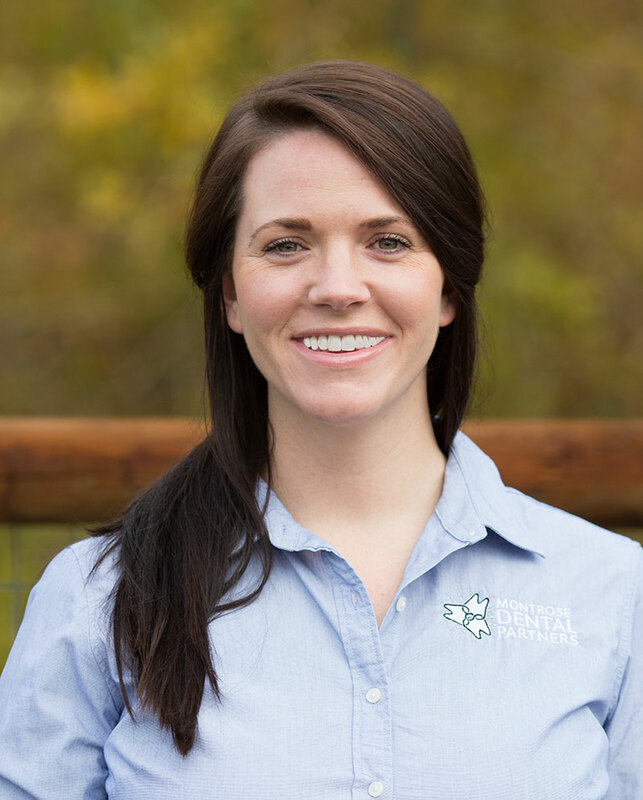 Mandy is a Montrose native who joined the team as a Dental Assistant in April of 2011. She has been with our office for five years now and has really enjoyed learning about Dentistry. She enjoys working closely with the team and getting to know the patients. Mandy and her husband, Colt, have been together since 2002. They have one beautiful daughter, Karli. Mandy and her family love spending time together, camping, hiking, swimming and playing with the family dog. Sundee brings 20+ years of dental assisting experience with her. She gained her dental assisting skills on the job and also has expanded duties experience. Sundees’ favorite part of her job is meeting and building a relationship with the patients. She was raised in Montrose, moved to Arizona, then moved her family back to Montrose to raise her children. Outside of the office, Sundee enjoys reading, gardening and spending time with her family. Bonnie joined the practice in February 2013. She brings 28 years of dental hygiene experience and 8 years of dental assisting experience to the practice. Bonnie received her Associates of Applied Science in Dental Hygiene degree in 1993 from Colorado Northwestern Community College. She enjoys being a hygienist, her favorite part of the job is educating and building relationships with her patients. She attends continuing education class to keep updated on the latest technology so she can treat her patients with the best quality of care. Donna is a native of Montrose and returned about nine years ago. She worked several years as a dental assistant and office manager before going back to school to become a dental hygienist. Donna graduated from Foothill College with a degree in health sciences/dental hygiene. She attended University of California, San Francisco to continue her education in public health. Donna also has a degree in business administration. Donna has numerous years of periodontal and general dentistry experience and also worked in a Public Health clinic. She enjoys the demographic diversity of working in a general dental practice. Donna’s primary focus as a dental hygienist is to improve patient’s oral health, and consequently, their overall health. In addition, she is a myofunctional therapist. After living in several states and cities, Donna returned to Montrose to be close to family. She is enjoying the less hectic lifestyle and the beauty of the surrounding mountains. Her interests include photography, various crafts, traveling, and gardening.